Its 1:30pm and I’ve just come back from my extended lunch hour at my sales assistant job at New York Magazine. I know what to expect and as always, I’m not disappointed. You see, the sweet and generous receptionist for the almost year I worked there there always left each sales assistant 2-3 little pieces of chocolate on our chairs after lunch as a little treat. I got used to this. I started to expect it and look forward to it. One day, I came back from lunch and was shocked and dismayed to see there was no chocolate there. I went to find out what went wrong, what happened and why I wasn’t getting my post-lunch “fix.” Much to my chagrin, I learned that the receptionist was out sick that day. Did she have no idea at the repercussions of this? So insensitive! Feeling agitated and unsatisfied I headed to the vending machine on the 2nd floor and grabbed a chocolate bar and followed through with the food script that had been presented to me on day one and that I now could not shake. Looking back, I knew I had become beholden to this daily treat even though I was no longer hungry after lunch and definitely didn’t need it. In fact, had it never been presented to me in the first place, I would have been none the wiser. Many of us struggle with eating in the work environment. We may eat more or differently than we do at home. We may stress eat or eat distractedly. We may ignore hunger cues due to the busyness and or cadences of the day or due to the office culture. In this article, I hope to outline some of the common causes for this and then, of course, what we can do about it. As social beings, we will often instinctively mirror or mimic what another person we are with is doing. So, if they scratch their nose, we might automatically scratch our noses too. This shows up in our eating style too. We will mimic what we see others doing in general and definitely at an office setting. If the boss is eating in meetings, than we feel at liberty to do so also. But, if no one is eating, we can be stuck waiting hours before we can honor our hunger. Maybe once we can finally access food, we’re so hungry that we end up eating fast and whatever is around rather than a carefully laid out plan for a balanced and nourished snack to help fuel you for the rest of the work day. Or we raid the vending machine. Often times there are foods available to us that may not be as common at home. We may see shared common space with leftover cakes, pies, and candy from halloween brought in by co-workers. We may have our boss order in subs for everyone for a meeting. We may be coaxed into an after-work drink with a colleague. We want to fit in, to not be different or eat differently than that of the office culture so we comply or share in that food experience with our co-worker despite it not really working for us. Plain and simple, there is a lot of availability to certain foods that is alluring and undeniable. We use food to relieve stress. Do you ever feel stressed at work? Are you ever on a deadline or work through lunch? There is so much nuance at work regarding our work ethic, office culture and our ability to create self-care there that sometimes our most basic needs get thrown under the bus. I remember at one job I had in my 20’s being so busy and so stressed that I didn’t even feel like I could take a break to pee! I just suffered through it. Some people will end up NOT eating all day and then completely break down at the end of the day and hit a fast food establishment on their way home. Others will deal with the stress by making spontaneous choices just to get something in their stomach. So, whereas with enough balance, eating rhythm and planning you might have that avocado toast and green smoothie, when we’re stressed and busy, we can snarf down a few easy pieces of pizza instead, or hit the break room where you know there are some cookies and soda. Your body nonetheless sees both of these options as a stress response and will further hinder your ability to relax and stay grounded. Related Post: Top 10 Crunchy snacks that don’t involve chips! “If it’s there you’ll eat it.” Studies have been done on proximity and access to food and human beings eating more of it as a result, irrespective of hunger. So, if there is one jar of candy on your desk, unwrapped (like jelly beans) you are far more likely to eat handfuls of it than lets say tootsie rolls, in a jar, up on a shelf, near a coworkers desk. The very proximity and easy access to the jelly beans (no need to unwrap them) will cause us to eat far more than the further away and wrapped candy. Our blood sugars naturally drop around the 2-4pm range during the day. As such we seek energy. Most of us don’t have the time or liberty take a nap at the office so we hit the vending machine or crave carbs and therefore eat carbs. Besides, where is the brussel sprout and strawberries vending machines? You can see how that can end up being an ongoing problem. Now we can re-visit to my two little pieces of chocolate each day after lunch at new York Magazine. Because I had inadvertently developed the food script, or habit of eating this chocolate every day, at the same time and under the same circumstances, my brain started to expect it and CRAVE it. While the sweet office receptionist was trying to be kind and bring joy to the office, it ended up leaving me totally hooked and ultimately disempowered. In many ways that I ended up seeking it out an alternative way, to follow the habit and food script that I had come to love. What food scripts have you developed in your own office setting? Solutions for eating empowerment in the work and office environment. Stash macronutrient balanced foods and snacks in your drawer, bag and in the office fridge (if you have). Write out a plan for the day and use it as a guide or blueprint to remind you to eat and take breaks during the day. Drink water throughout the day and take mini-snack breaks. This is particularly helpful if you do tend to get stressed or distracted at work. Close the door, go outside or even to a bathroom stall and take 2-5 minutes to focus on your breath and to ground yourself and be mindful of what is going on with you, what you need and how your body is feeling. Even walking up and down some stairs to see a coworker rather than calling him or her can help break the food script and serve to give you more energy. Help plan for and anticipate your challenging times of day. If you know that the office break room is triggering for you, avoid it or take a different path that circumvents visiting that spot. Make sure there are plenty of balanced and nourishing foods on hand, right within your grasp or nearby to grab when you need something to eat. This can’t be done spontaneously. 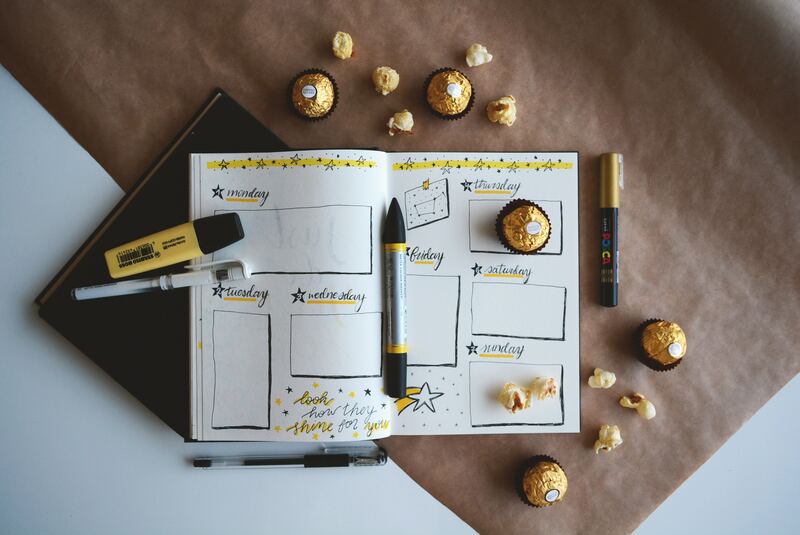 Part of eating empowerment means anticipating and planning for your day in advance, by knowing your hunger, knowing your triggers and your food scripts and planning accordingly. Command the food narrative at the office. Be part of the solution by taking the lead. 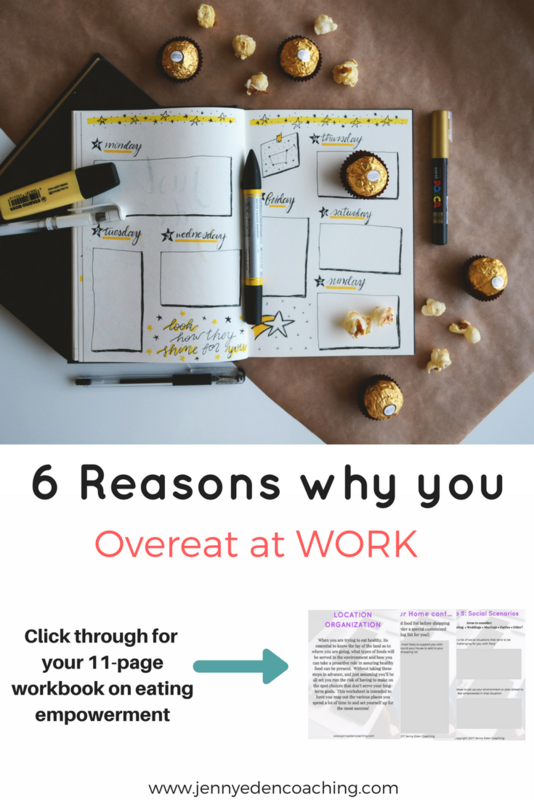 What else do you do to feel empowered around your eating in the workspace. What have been your biggest challenges and best assets or strategies that have helped you. I’d love to hear your thoughts and ideas and experiences in the comments section below! All of this is so true! I find I snack way more at work than I would normally, or skip meals that I wouldn’t depending on the stress or boredom of the day. Great solutions for how to fix the problem!